This product is sold in European sizes. We measured a selection of these jackets and also tried them on our Fit Check mannequins. 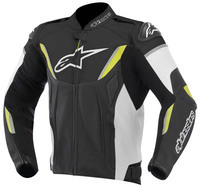 The overall sizing of the jackets is accurate to the Alpinestars sizing chart for overall chest size (US chest size in inches is 10 points less than the European jacket size). I’d suggest you measure yourself with a tape and get your chest size, and if you have a bit of a belly you can also check your max belly. If you know your suit coat size, that works too. Then you can use the size chart to pick the smallest size jacket that will be big enough for both your chest and belly using the chart below. This is a sport cut jacket, but of all the various models of Alpinestars’ sport jackets, this model is the most relaxed, and the most “American” cut. First of all, the taper from chest to belly is less than other sport/race styles. Full on race jackets will have a “drop” from chest to waist of about 8”, and most European sport styles will drop about 6”, but this one drops about 4” which means you’ll get a good fit if you are average to stocky or muscular. But even if you are more trim, the jackets have well-functioning tabs at the waist so you can tailor the fit to your own waist size. To also help with those that have a more broad chest, this model has a great deal of flexible fabric material in the underarm and behind the shoulders. And those stretch areas really do stretch a lot. Sizing Tip for Those Using Upgraded Armor: Swapping the foam back pad in the jacket for the Nucleon KR-2i back pad doesn’t change the fit a lot. But if you add the chest pads AND the KR-2i, then you’ll want to add 1 or 2 inches to your chest measurement for the purpose of choosing a size. If you are planning on the Bionic Race back protection AND the chest pads, then add 2 full inches to your chest measurement. Today, I’m looking over both the solid leather version and the perforated leather version of the 2015 GP-R Leather Jacket. It just so happens I had a visit from the national Alpinestars rep in the office today, a friendly fellow named JP, and he pointed out some of the highlights to pass along to you. It was a helpful discussion because Alpinestars makes a wide variety of sport leather jackets and they use a virtual alphabet soup of letters and dashes to name them all… and not so many letters I might add… typically a mix of G, P, R, Pro and Plus with a lot of hyphens scattered throughout. He really couldn’t point out any consistencies to make sense of it all, but I learned the “-R” part of the name pertains to the overall fit. As I described above, this style works best for the American build and isn’t cut solely for skinny guys. It will work well even if you have a broad muscular chest, uh, or even a bit of a gut. Anyway, that, of all things, is the biggest differentiator between this model and the other sport leather jackets. As I mentioned, the jacket comes in a solid version and also a perforated version. Those who ride in warmer weather will welcome the perfs and those who want to be able to layer and use the jacket in cooler weather will want the solid version. We have two different product pages for each version, so buy the size/color you want from the appropriate product page. Both styles have the full blown armor package from Alpinestars that we’ve had for many years now… CE armor in the shoulders and elbows, and foam pads for the back and chest. The foam pads are supplied as standard, and really are just “place holders” so you can remove them and install an upgraded back pad in the jacket’s liner, or you can buy a more robust race-style back pad (see below). You can also upgrade the foam in the chest. If you do that, you’ll have more armor than any other sport/race jacket we sell! Alpinestars attention to assembly details and the quality of the materials really looks great and personally I think their leather jacket styles represent about the best quality/price of any jackets we offer. Just looking close, you’ll see little things like the Neoprene padding around the arm cuffs, the inside of the collar and on this style, even under the side waist adjustments. The reflectives are even special too… the band on the forearm is “built in” and is sort of rounded, just so it looks better (see our “night shot” in the photo gallery by taking the “View Larger Images” link above). Another little nicety is the waterproof wallet/electronics pocket inside the main zipper.